William R. Donnell II, a schoolteacher and descendant of Bath shipbuilders, poses with his sons William, left, and Juan, right, next to the schooner Mary E that he was restoring in the mid-1960s. 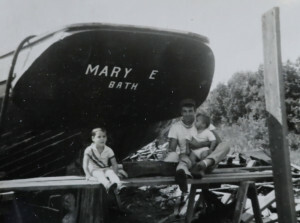 Above, William R. Donnell II, a schoolteacher and descendant of Bath shipbuilders, poses with sons William T., left, and Juan, right, next to the schooner Mary E that he was restoring in the mid-1960s. At top, Mary E has been running cruises in Connecticut since 2006.